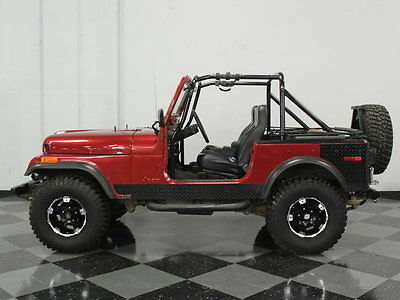 Given how quickly they move through our showroom, Jeeps like this 1976 CJ7 are finally getting respect from collectors as well as from folks who still understand that there's no better off-road machine than this. Nicely restored with a lot of new components, this is a trail-ready 4x4 with a lot to offer, including a very reasonable price.The burgundy paint is a lot nicer than what it was wearing originally, and the rich metallic finish looks great on the upright Jeep bodywork. It's a few years old and this is a Jeep, after all, so it's not perfect, but for a vehicle ostensibly designed to chase through the mud, it's pretty darned nice. The rockers and rear corners of the body have been appropriately reinforced with black diamond plate, giving the Jeep a tough look that's also highly functional. The side steps were also added in 2014, so it's easier to climb aboard and a set of high-output KC lights were added up front. You'll also note heavy-duty bumpers with built-in tow hooks, fresh rubber fender flares to cover the oversized rubber, and a heavy-duty spare tire carrier with a matching fifth wheel. 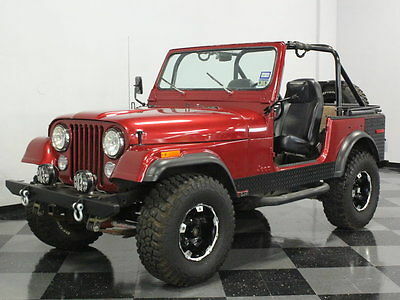 Few Jeeps are this nicely equipped, this well-finished, and this thoughtfully built. The interior is the familiar low-maintenance Jeep stuff that you've come to expect. The high-back buckets wear fresh black vinyl seat covers, a material that wears like iron and you can just hose it off after a day playing in the mud. 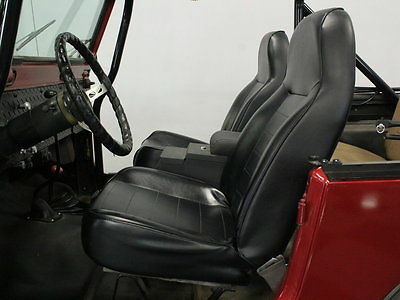 The floors are covered with heavy duty rubber mats and the back seat looks like it might be original, or at least wearing an older seat cover. There's more black diamond plate on the dash, with updated knobs and handles, a correct speedometer with built in temperature and fuel gauges, and a pair of auxiliary gauges for voltage and oil pressure. There are a pair of power outlets under the dash, so roughing it doesn't necessarily mean going without your tech, and there's a locking center console for a bit of security. Overhead there's a robust 6-point roll cage as well as a new soft top and doors that were installed just last year.Jeep's rugged and reliable 258 cubic inch inline-6 is the engine most CJs use and it's a great choice. Torquey and willing to just crawl along at little more than idle speed, it was built for situations just like this. It's mostly original and runs great, thanks to a rebuilt carburetor and new ignition components. It's not pretty and showy, but it's highly functional and doesn't' need any excuses. 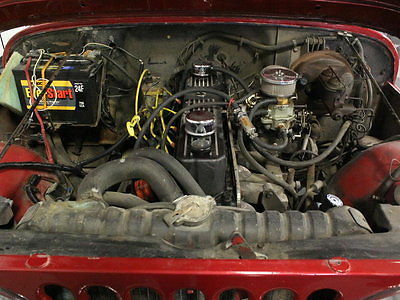 This Jeep is equipped with both power steering and power brakes, which are welcome on a vehicle with oversized tires, and a custom tubular header feeds the exahust. A 4-speed manual transmission feeds a 2-speed transfer case, while the axles are filled with 3.54/3.55 gears so it's an easy highway cruiser. There are newer shocks underneath, a recent front driveshaft, and custom wheels with 32x11.50-15 BFGoodrich Mud Terrain T/A radials that were installed in 2014.The Jeep always looks like it's ready for an adventure and this one has a lot of money recently invested in keeping that spirit alive. These machines still represent a ton of fun for the money. Call today!